A great alternative for people who like Vang Vieng and it's scenic limestone mountains, but do not like the party din there, is Nong Khiaw (also: 'Nong Khiew', 'Nong Kiew', 'Nong Kiau' or 'Nong Kiao'). It's situated at the banks of the Nam Ou (river) on the road connection between Oudomxay (Muang Xay) and Xam Neua. 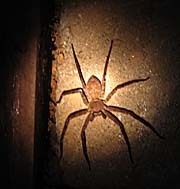 The little nest's surroundings can clearly compete with those of Vang Vieng - they both are fantastic! 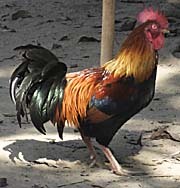 The Nam Ou is an old aquaintance who arises from Phongsali very close to the Chinese border and is running down through the mountains until it joins the mighty Mekong River a few kilometers north of Luang Prabang. Therefore the Nam Ou is, at least seasonally, an alternative route connecting Nong Khiaw with Luang Prabang (and Hat Sa in Phongsali). Unfortunately, latest news tell that the boat connection to Luang Prabang is no more existing; another of the many, many planned dams in Laos has cut the Nam Ou, what means a great disaster for the river's ecology. 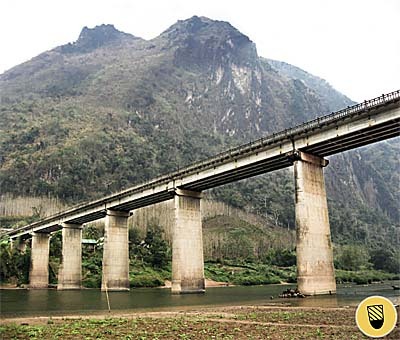 (For more information on Laos' plans becomming the 'battery of Southeast Asia' have a look for the article 'Damming the Mekong'. However, it's said that the trip can be split in two boat passages, leaving the first boat at the dam, walking around it and continuing with another boat. One should be aware of the fact that the boats are much slower and much more expensive than the busses are. Being crowded into a boat with a ceiling it could be that one has difficulties to really enjoy the scenic environment. The Laotian skippers defenitely have no understanding for that and are therefore no help - these guys have no sense for natural beauty. 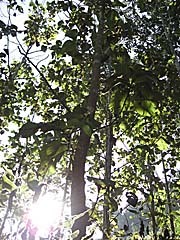 In their mindset the jungle is the enemy and has to be fought, cut and burnt. Some of the kids of Nong Khiaw; it's great fun for them to be photographed. At least a few years ago it was always a big spectacle. 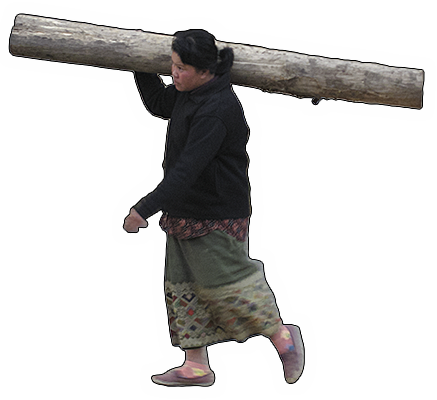 Since nowadays everybody, also the peasants of Laos, own smartphones and make easily their own photo click-clicks, it's no more anything special. By the way: demographics predicts that the Laotian population will double within the next twenty years. The usual bus connection is from Luang Prabang or Oudomxay (Muang Xay) or vice versa. Unfortunately, as much too often nowadays, the smart deciding local authorities moved the local bus station some distance out of the village to make sure additional business for the local tuk-tuk and motorbike drivers. These infrastructural malices make travelling in the rotten transport system more annoying than it is often enough anyway. Before that miserable invention the busses went to the pier next to the bridge. However, if not too overloaded with baggage or footsore, it's still possible to walk the rest of the way and it gives one the first impression of the place. Particularly impressing are the mountains who frame the spot, together with the river. It's a very picturesque place, and on the way from the bus station to the village center, what is west of the bridge, there are the first guesthouses. 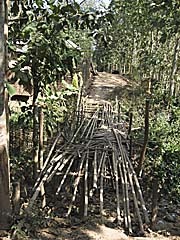 This part of the road is seamed with mostly very simple wooden dwellings. A good choice of accommodation is particularly available east of the bridge. There is also no shortage of small tourist restaurants. Nong Khiaw is touristic, but it's not overrun like Vang Vieng or Luang Prabang are. Despite a rising number of visitors it's yet still quiet and peaceful, and the tourists are unusually friendly and open towards each other. The fabulous mountain scenery seems to lift the spirits. Since the spot is so popular for tourists a lot of extra money is flowing into the local community. In the last years one could see the traditional bamboo and reedgrass shacks being replaced by more solid concrete houses with tin roofs. Now the locals will be more and more equipped with private cars and motorbikes, and it is to expect that the quietness of the beautiful place will be seriously disturbed. Till recently the loudest impact on Nong Khiaw were the river boats with their engines. Fortunately, there is not much traffic on the river. The local boatsmen are keen, though, to offer tourists boat tours, particularly up to Muang Ngoi. What one can do here is walking, walking, walking, and here and there a bit climbing or crossing a river. 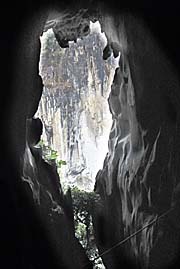 Tam Phatok Cave east of the river is worth to be visited. Of course, there is a ticket booth. In Laos you don't visit anything without being cashed extra. 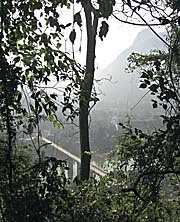 There is a jungle path following the left bank of the Nam Ou for several kilometers upwards. 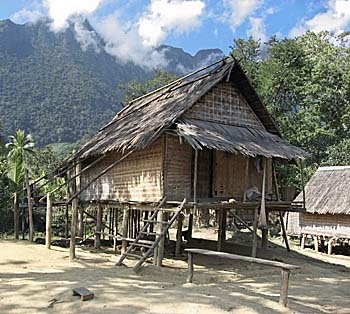 There are two tribal villages one can easily visit without a guide. One can also further continue and discover more of the fantastic landscape and it's villages. There are many more hiking activities possible, just depending on the will and the fantasy of oneself. With the booming tourism more and more tour operators (mostly from outside the place) come to offer day tours or longer tours with overnights in villages. That's often labelled as 'ecotourism' - sounds good and trendy when ordinary tourism is washed green. Personally I consider such organized tours as a sheer punishment - one is crammed with other tourists in too small vehicles and dammed to spent a whole day with them, mostly passively consuming the offer. The tour guides usually don't know much of what they are doing, they explain little and often the wrong things and it's futile to ask them questions. There are generally very, very few good guides who really know the places they go. Last but not least Nong Khiaw is an excellent place to spend time in the hammock in front of almost any bungalow and just to enjoy the mountains and the river. Meanwhile, according to the fast touristic development, news say that there are already several places with internet (speed just a tiny little bit faster than no internet at all), and even a new bank branch with an ATM. The locals are obviously not very welcoming to foreigners, but for business. Behind the occasional smile there is a trench between villagers and visitors. If possible the locals will take advantage of the strangers and overpricing is common. Most clearly that is when it comes to transport prices, but also accommodation. In the restaurants there are usually fixed prices written in the menu. One has always to check the bill though; mistakes to the disadvantage of the guest happen not seldom. The poverty of the people here is not only a sufficient explanation for that phenomenon - it's mere greed behind. I wouldn't wonder if the locals occasionally boast with how much money they pulled out of the tourists if they are among themselves. The Laotians generally are kind of careful with western foreigners. That's no surprise, after long experiences with French conquest, occupation and the French and particularly American Indochina Wars, the locals learned not to trust Westerners. 'Long nose no good'. But money good. Very good. However, there are not only western tourists coming here, but more and more Asians as well. 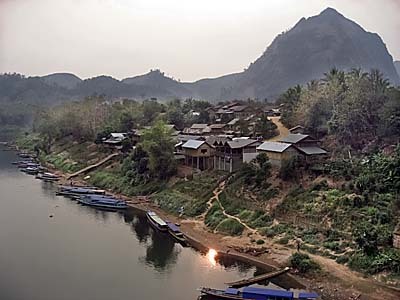 It's maybe worth to know that Nong Khiaw's neighbouring village, Muang Ngoi (Neua) bears the same name as the district, but it's not the district capital. 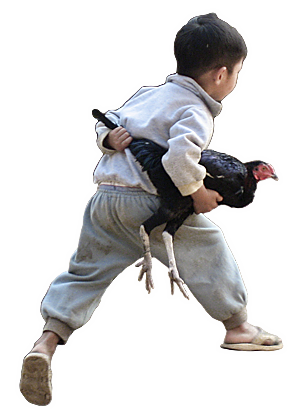 To make the confusion bigger, Nong Khiaw itself is also sometimes called 'Muang Ngoi'. 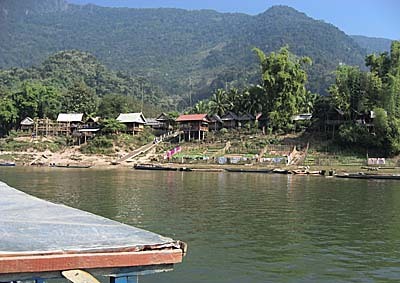 However, Muang Ngoi Neua is a some 90 minutes lasting boat trip riverupwards from Nong Khiaw, back downwards it takes a bit more than an hour. 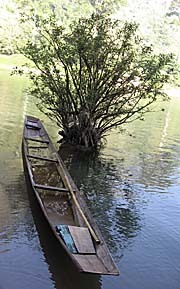 This place is cut off the roadnet; the boat connection is the only one to the outher world, except some walking tracks through the forests. 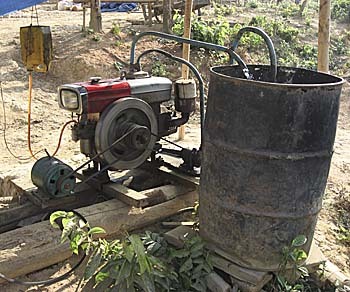 There is also only self-generated electricity in the village, so one has power only for two, three hours in the evening. The remoteness gives the place a little bit the feeling of an island, separated from the rest of the world. 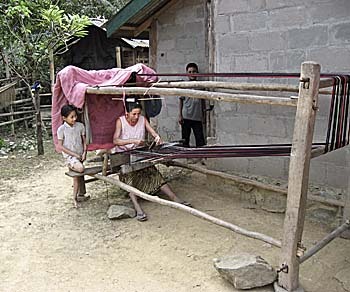 The village of Muang Ngoi is mostly a stretch along a narrow road parallel to the river. It's also pretty popular among tourists and there is plenty of simple accommodation and many restaurants. At the northern end of the place is a Buddhist temple. Surprisingly, one wouldn't think that such a small, remote and unknown place has a long history. But Muang Ngoi Neua was once a Buddhist center with three monastries, who all were destroyed by American air raids in the Second Indochina War. The history of the hamlet dates back to the 15th century. Wat Okat Muang Ngoi, formerly Wat Neua, has been rebuilt after the war. The people of Muang Ngoi Neua. Image 1: A group of women is having dinner together. In the background a shop with a man who holds a baby in his arms. Image 2: A group of Buddhist novices after having a bath in the Nam Ou. Image 3: A group of monks is chanting for the two almsgiving women who kneel in front of them. This ceremony happens every morning at sunrise, what is usually around six o'clock. Although I personally try to avoid touristic places, they have certain advantages. Tourism provides a basic infrastructure in food and sleeping opportunities, together with transport. Besides, in this case here the tourists are mostly self-organized and much more open minded than it is usually the case (compared to tourists in Luang Prabang or Vientiane for example). 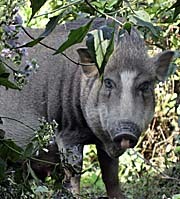 But, for whom Muang Ngoi is still too touristic can continue further into the countryside. There are many hamlets around, places with only five to ten houses of whom some meanwhile smelt business and offer basic accommodation and food for tourists. There one can spend lazy days in the hammock, watching the sky, the weather, the peasants, the animals and reading the books one ever wanted to read but never found the peace to. Wat Okat Muang Ngoi at the northern end of the village.